It's a BIG issue of Little Things Thursday this week! Something came up last week, and I didn't quite make it this far. I hope this extra long post will make up for it though! 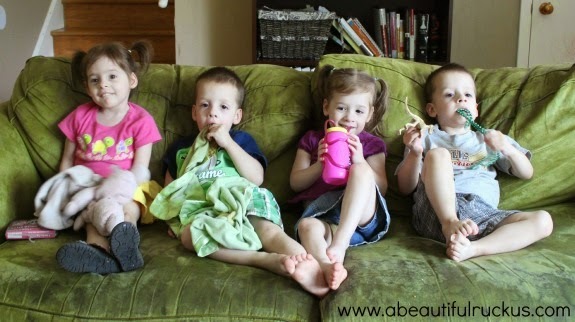 Every so often, I like to plop them all down on the couch for a group photo. The girls normally cooperate, Elijah is hit or miss, but Caleb is really difficult. I generally end up bribing them to hold still while I madly snap as many photos as possible. Then I just hope that one is semi-good while my kids scramble away from me. This photo was taken with "The Magic School Bus," or "Yellow School Bus" as we call it at our house, playing behind me. 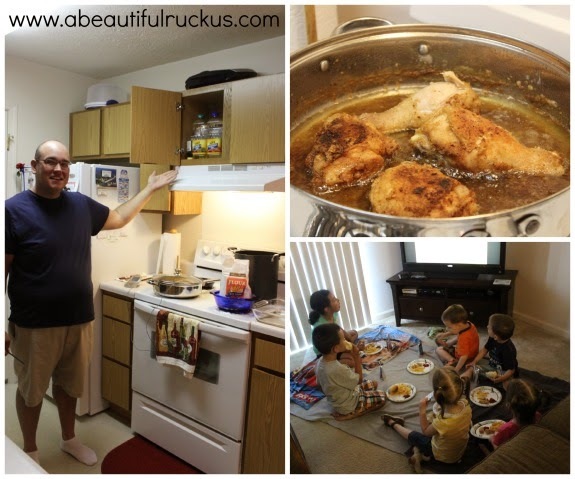 Left photo: Charles demonstrating the different types of oils and the best one to use for fried chicken. Top Right Photo: The amazing fried chicken! Bottom Left Photo: The kids all enjoying homemade fried chicken nuggets and fries. My friend, Amy, who is a chiropractor found herself short some help for the summer. Starting this week, Sean and I worked it out so that I could help her man the front desk for a couple of hours twice a week. It's so weird to suddenly be in a work environment again. But I have to admit....I'm kind of loving the 2 hours of no whining that I get for the next couple of months! This photo made it on our first Summer Bucket List post yesterday, but I had to post it again. 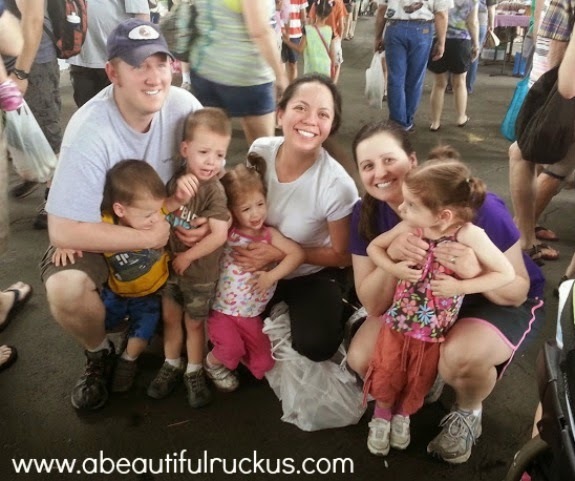 It was SO fun to see our NICU doctor unexpectedly at the Farmer's Market over the weekend! Caleb is always so focused, so stoic, and so detailed. One of his favorite things to do is line things up. 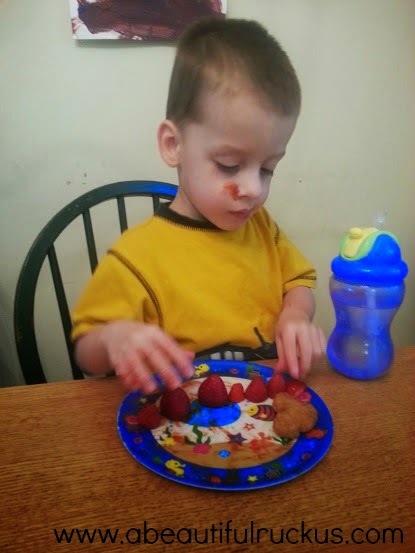 I caught him lining up his strawberries at dinner the other night (plus he ate about a 1/2 pound of them during that meal!). He's very particular and gets really frustrated if whatever he is working on won't stay in order. I really think he has an engineering brain in his head...now if we could just get him to talk more so that he can tell me if that is true! Part of the fun of a CSA box is seeing what's inside. This week was a little sparse, but that's the name of the game when you are running on the same growing schedule as farmers. Some weeks have a little more, some weeks have a little less...of course, it's easier when the two main forms of produce aren't Swiss chard and beets. Thoughts on what I can do with those?! This week we had: 1 small head of butter lettuce, 2 small tomatoes, 4 oz of very smashed strawberries (sad! 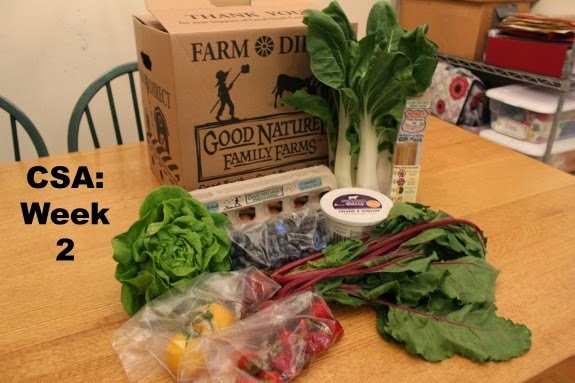 ), 8 oz of blueberries, some beets, Swiss chard, eggs, honey sticks, and vanilla yogurt. We were missing onions from our bag, so our CSA is supposed to replace those and the strawberries that ended up under the beets in a couple of weeks. I love that they make good on it! My mom and grandma pickle beets every year. Ideally, you'd need more, but I'm sure pinterest has a good idea or two for what to do with them so the kids will eat them. Saute the beet greens with some shaved garlic, yum! Roast the beets in a very hot oven with whatever else you have (potatoes, onions, etc), drizzled with olive oil.